Mr James S. Thomas, R.W.M. of Lodge Scoon & Perth No. 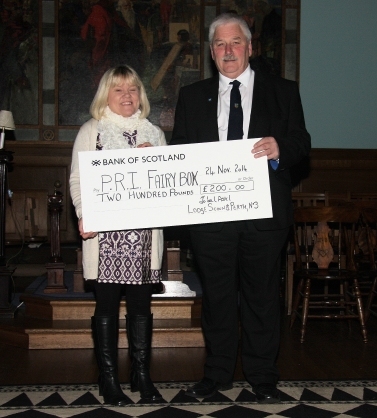 3, presented Ms Barbara Greig, Perth Royal Infirmary, with £200 towards the purchase of toys for the PRI Childrens' Ward Fairy Box. Children in the ward who are undergoing unpleasant medical procedures and are given a present from the Fairy Box to help cheer them up. Ms Greig welcomed the donation as the toys bring a great deal of joy to the children.